Can Christian Benteke Join Liverpool's Elite Strikers? "I know Liverpool is a big story. They’ve won league titles and the Champions League five times..." Christian Benteke. 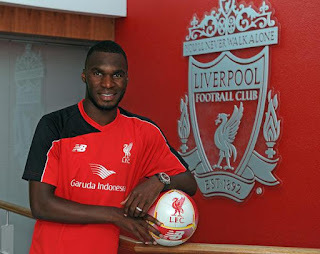 A warm welcome to Christian Benteke. All Liverpool fans hope that Christian will join the elite group of Liverpool strikers that have scored 20 or more league goals in a season. Liverpool have been blessed with some great goal scorers. Even 'God' played up front. However, as you will see, it is a big challenge to join the elite strikers. This article was also published here on lfchistory.net on 27th July 2015. A Liverpool striker has scored 20+ league goals in 20 of the 53 seasons between 1962-63 and 2014-15 - see the summary chart below. The analysis starts in 1962 because this was when Bill Shankly returned Liverpool to the top flight of English football. The chart also highlights the 13 title winning seasons since 1962. Nearly 70% of the title winning teams included a striker that scored 20+ goals. There have been only two seasons in which two strikers have scored more that 20 goals: 1963-64 and 2013-14. Remarkably only 11 strikers have scored 20+ goals in the 53 seasons since 1962. Who are these special players? The 11 elite strikers are shown in the table below, sorted by the number of times the player achieved 20+ goals. All 11 of these strikers were great players. Roger Hunt tops the list with 20+ goals in 5 different seasons. Ian Rush is just behind him with 20+ goals 4 times. Wow, that's an amazing 20+ goals 9 times by the top 2. Suarez, Fowler, Aldridge and Dalglish all scored 20+ goals twice. And Torres, Barnes, Sturridge, Johnson and St John all scored 20+ goals once. A special mention to a couple of Liverpool high scorers who didn't quite make the elite strikers list. Michael Owen scored 19 goals twice and 18 goals twice; Michael was only 18 years old when he scored 18 goals in 1997-98. And John Wark was the highest scoring midfielder with 18 goals. Before Liverpool signed Benteke there was a lot of discussion about the ideal age to buy a proven, quality striker. The average age of the elite group is 25.6. The youngest elite striker is Robbie Fowler who scored 25 goals in 1994-95 when he was only 19 years old. Robbie is the only player in Liverpool's history to score 20+ league goals when under 20. And the oldest elite striker is John Aldridge who scored 21 goals in 1988-99 when he was 30. 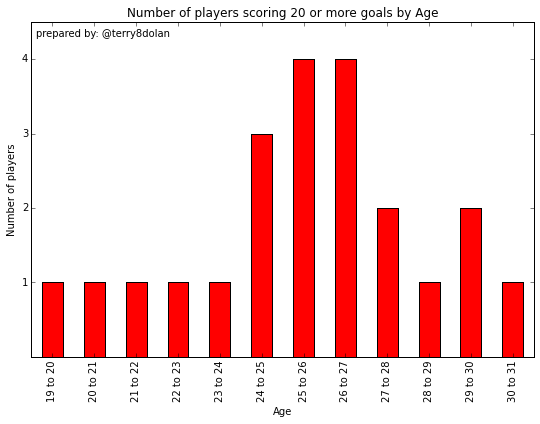 Let's take a closer look at the distribution of the number of players scoring 20+ goals by age. Christian Benteke is 24 years old, 25 in December 2015. He is just entering the age range that contains the highest number of elite strikers. Brendan Rodgers has already shown that he can build a team that supports a striker who can score more than 20 league goals in a season: Luis Suarez achieved this in 2012-13 and 2013-14. In 2013-14 Luis and Daniel Sturridge achieved what has only been done once before in modern times - they both scored over 20 goals, just as Roger Hunt and Ian St John did in 1963-64; for more on the record breaking 1963-64 season, see my previous article LFC: A Striking Trio. Good luck to Christian Benteke. Be inspired by Liverpool's 'big story' and join the elite strikers. Thanks to the excellent lfchistory.net for providing the raw data. And thanks to the python community for providing the data analysis tools. You can view the IPython notebook that contains the data analysis by simply clicking here. The notebook is also available for download from the lfcelite repository on github. Liverpool fan. Stood on the kop and watched Paisley build the best team in the world. | #LFC comment and data analysis. | Published at @lfchistory and #TTT. | Still likes to code. And does some Telco and IT stuff.